There are some comings going on here at Les Fragnes. The first one is Christmas, but of course that’s coming everywhere! Santa is up on our gate and the first Christmas decoration has gone up in the house. Caitlin bought her two brothers advent calendars with chocolates in (what a great invention) so Advent is really being enjoyed by Ruadhri and Benj. And the second coming is that Benj has come of age today. My first baby is 18 – wow. Poor old Benj is full of flu though, so is having a quiet, achey birthday at home. Caitlin came home from lycée today to join in the family party tonight and that’s a real gesture of love as she’ll have to get up at 6am tomorrow morning to get the bus back to school. And Caiti hates early mornings. Aisling of Les Fragnes is coming along well. She has her cosy coat at the moment and is only going outside for a couple of hours at a time. It’s just too cold for a tiny cria. She gets bigger and stronger every day, and is fascinated by everything around her. She particularly likes trotting after the ducks and chickens. They’re not so keen on it though! We’ve just heard that our next consignment of carp for the lakes will be coming next week. We’ve waited a long time for them. Since the lake is usually frozen by Christmas, we were starting to have visions of having to make holes in the ice in order to get the fish in! We’ve finished removing the snags from the lake. We dropped the level so that we could pull the fallen trees and branches from out of the mud in the shallow end. It was muddy, squelchy work, but well worth the effort. 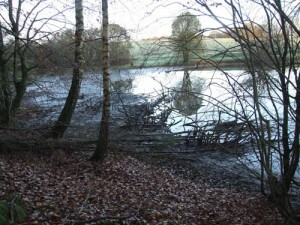 Here’s a ‘before’ view of the lake – the ‘after’ one will be coming soon!